1 Made from pure wool, Harris Tweed is a breathable, non-allergenic fabric with amazing insulation qualities, so it will keep your dog warm all winter long. 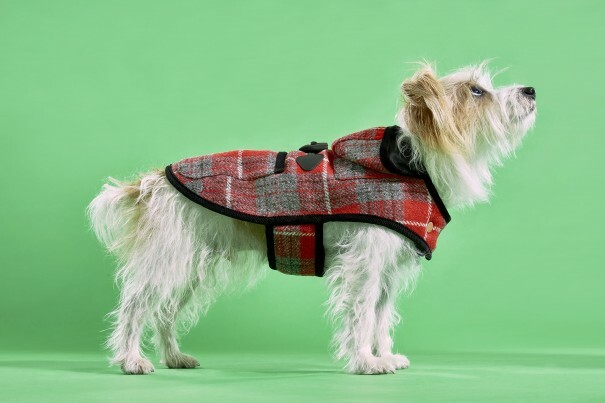 LoveMyDog founder Lilly Shahravesh has been working with it for over 13 years – her dog coats, blankets, beds and carriers all make use of this cosy material in cool tartan, checks and plain shades. 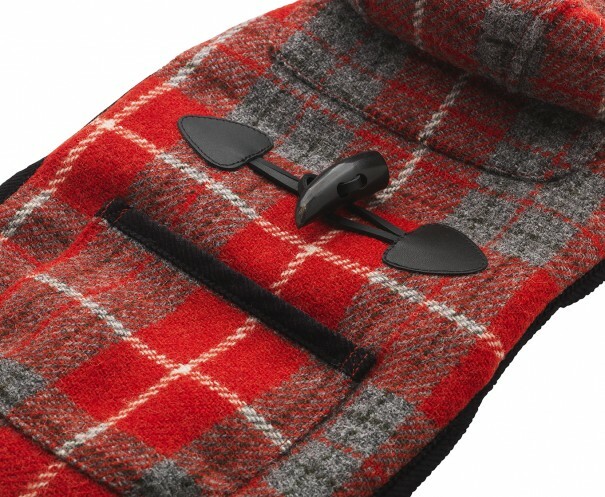 The Watney Duffle Coat is a classic example, in Highland-chic red tartan. 2 Known in its native Scotland as ‘clo mor’ – or ‘big cloth’ – Harris Tweed is super practical, even for pooches who love to get into muddy scrapes. Just let the mud dry, then remove with a dry brush. Or, if walkies has been a really serious affair, a little soapy water and a damp cloth should do the trick. Our tweed is Teflon®-coated to repel stains – treat it well and it will last for years. 3 Harris Tweed is one of the most ecologically friendly fabrics in the world. It’s been made in the same way for over a century, using only hand looms. Almost zero energy goes into its manufacture and it’s made from all-natural virgin wool. 4 So iconic is the fabric that it is protected by an Act of Parliament. 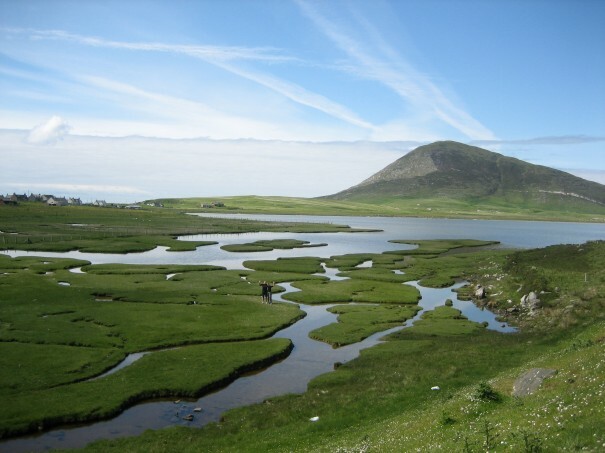 The 1993 ruling decrees that Harris Tweed must by dyed, spun and woven in the home of an artisan weaver in the islands of the Outer Hebrides. 5 Despite its homely origins, Harris Tweed has made it onto the catwalks of Chanel and Prada – the ultimate example of heritage chic. LoveMyDog’s canine couture is just as carefully crafted, with tweed coats and carriers tailored to fit every size and breed. Why have anything else this winter? 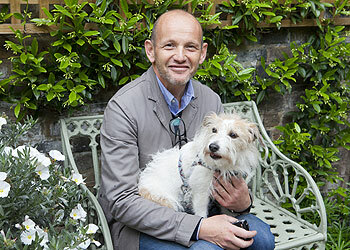 Expert tips on creating a dog-tastic garden, plus tales of mischief with Rabbit’s sister Gina. 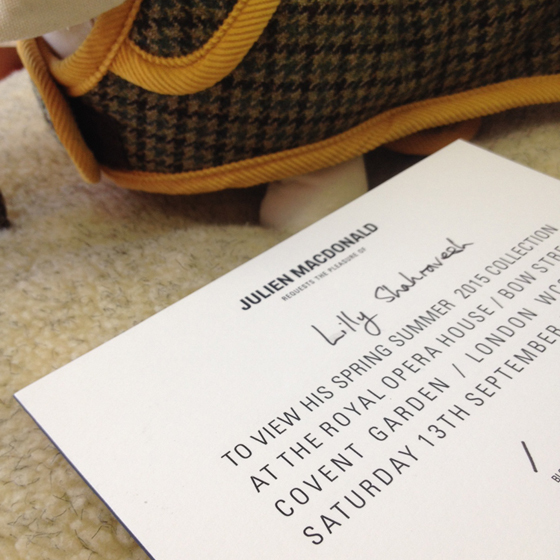 Life goals: run your own design business, make that business garden design, absolutely take your dog to work with you. Sounds like Chelsea gold medal winner Tommaso del Buono has pretty much nailed it. But how does having a slightly naughty Norfolk Terrier/Jack Russell cross really fit in with an international career designing high-end gardens? We spoke to Tommaso about life with Gina, including squirrels, cat flaps and one particular disgrace involving baby deer. A cheeky little bundle of Norfolk Terrier/Jack Russell cross, Gina’s got a big personality for such a wee pooch. In fact, here at LoveMyDog we’ve got a pretty good idea about Gina’s personality; she’s the sister of our very own Rabbit, both pups of the lovely Tulip. Once an unstoppable bouncing force of nature, Gina’s now a grande dame of 12 years old and has slowed down a bit – thank goodness. Just one look at Gina’s beady little eyes and you know it: that doggy boisterousness has landed her in hot water more than once. One particularly epic squirrel hunt saw her scurry enthusiastically into the undergrowth in hot pursuit, only to scurry out equally swiftly sporting a nasty bite on her neck. It seems that Gina had accidentally trespassed on the property of a large and fearless rat. And sassy Miss Gina’s not afraid of taking on much bigger creatures. 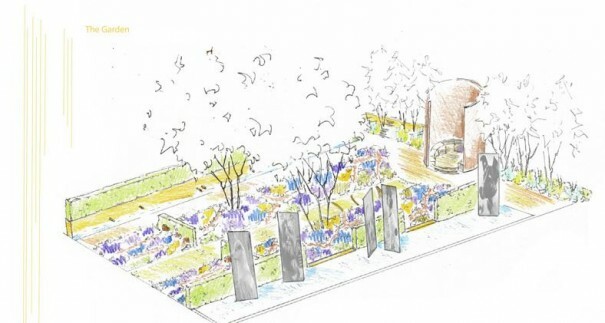 Gina-free zone: del Buono Gazerwitz Landscape Architecture’s gold medal-winning Chelsea Flower Show garden for the Telegraph. Obviously Gina is queen of the castle when it comes to her own garden, though. Tommaso and his partner have a country place where Gina has room for lots of doggy manoeuvres – and she makes sure the humans don’t get too comfy after a tough week at work. “She always tries it on!” exclaimed Tommaso, “We’re constantly having to throw balls and sticks for her. Even in the urban sprawl, the pair make the most of London’s green spaces. When Tommaso lived in Bayswater, Gina was a regular in Hyde Park. Her favourite hang-out now, though, is hip Victoria Park, which is particularly well-stocked with squirrels, not to mention a temptingly big lake for cooling doggy paddles on a sweltering day. Having a four-legged best buddy has actually helped Tommaso when working with dog-owning clients. There’s nothing like experience to give you a special insight when asked to design pooch-friendly areas, so he’s all over important touches such as non-toxic planting and dog-friendly ponds. “We don’t design around the dog but you have to bear the dog in mind,” he explained, “One thing that’s really important is making a place secure for a dog. Sometimes more unusual challenges come up. Tommaso’s business del Buono Gazerwitz Landscape Architecture recently completed a garden where they uncovered an old air raid shelter. Everyone agreed the shelter should stay, so they left it in situ but designed a bespoke metal grille to prevent the owner’s inquisitive Pomeranian dogs from wandering in. Overall, it sounds like a bonus to us – hire Tommaso to design your garden and you get to hang out with Gina too. For more proof that gardens can be dog-tastic havens AND gorgeously designed, check out the Dogs Trust garden at RHS Hampton Court Flower Show on Tuesday 5 – Sunday 10 July. 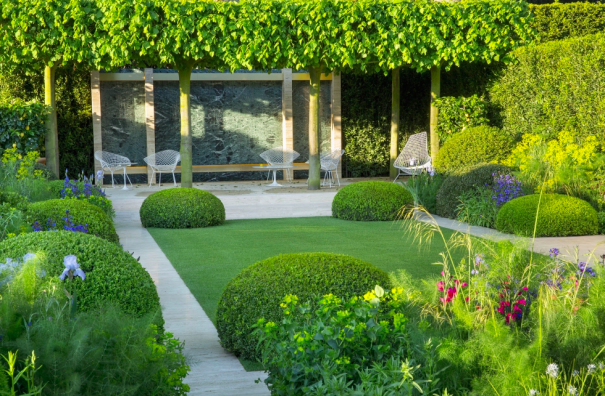 Designed to celebrate the charity’s 125th year, this contemporary space includes sneaky sniffer tracks woven into the herbaceous borders for dogs to forage and sniff out treats. We might even have a try ourselves. Fast and curious: here’s what life is like when you share it with a sighthound (clue: they’re not for everyone). Whippets are far from a poor man’s greyhound. Though they strongly resemble the breed they originate from, they’re a creature of very unique quirks. Elegant, powerful, shapely and sweet, the beautiful dogs are just as up for snuggles as they are for adventures. It’s these precious idiosyncrasies that present a series of life lessons, hilarities and heartfelt moments for Whippet owners. Here are just a few. Hands up if your furry friend follows you from room to room like he’s attached to your calf? Or cosies up under your blanket? We thought so. Whippets love nothing more than being snuggled up – and are extremely adept at finding cosy spaces where none seem to exist, much to our constant bewilderment. Whippets love: With their slender physique and sensitive skin, Whippets need luxuriously soft, padded beds to catch up on their beauty sleep. 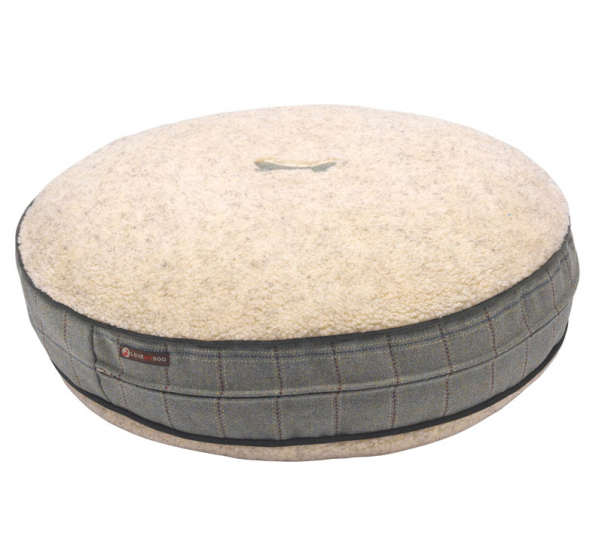 Treat yours to this tweed dog bed with thermo-regulating filling. Any Whippet owner can relate to the eye-watering lash of the dog’s tail as they pelt pass, Speedy Gonzales style. Like a whip across the thighs. And as for the furniture? That happy tail can clear lampshades, coffee tables, you name it. If there’s one thing Whippet owners know (and have probably learnt the hard way) it’s to keep your favourite items up high. Waaaay up high. Your lovable critter will chew everything you own and you’ve come to accept that that’s just the way life is now. You know those dog owners that breeze by on their bicycles, leash attached to the handlebars, as their pooch gracefully gallops by their side? You are not one of those dog owners. As the fastest accelerating dog in the world, Whippets challenge even Greyhounds for top speed – and you’re likely to hit a bush at 80mph if you even attempt such a thing. Due to their svelte figure and lack of body fat, Whippets get cold easily. 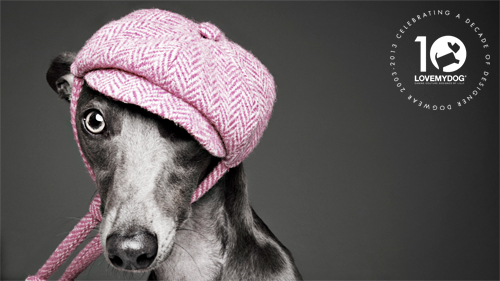 To a Whippet owner, this can only mean one thing – a complete and utter fashion frenzy. Wrapping your pooch in a properly-cut coat feels as momentous as Prince Charming bestowing Cinderella with her glass slipper. 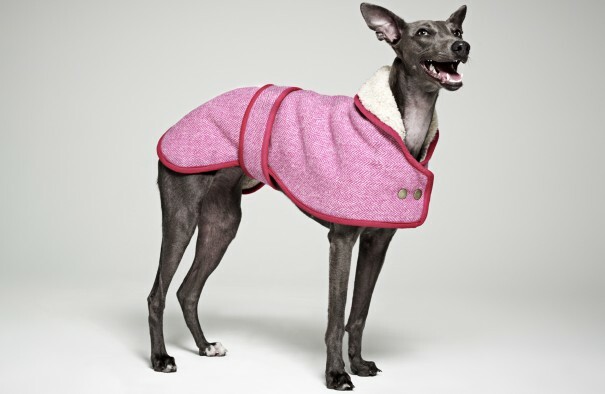 Whippets love: End shivering in style with this hand-woven Whippet dog coat in pure wool tweed. 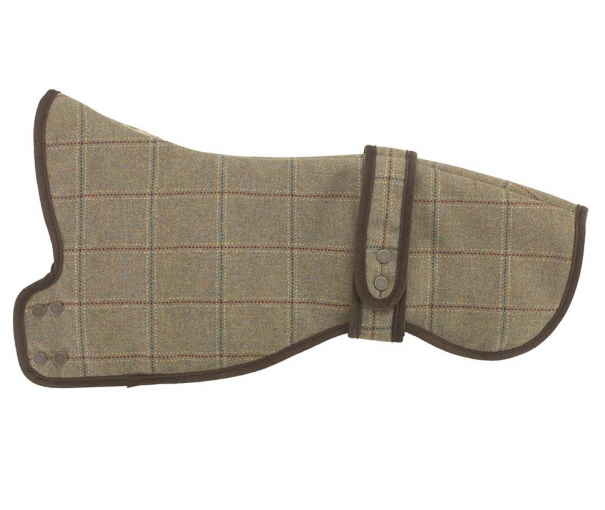 Ultra smart, with a soft fleecy lining especially for sensitive Whippet skin. Nothing beats coming back from a walk and relaxing with the glossies on a lazy Sunday, especially when you spot your own designs in print! 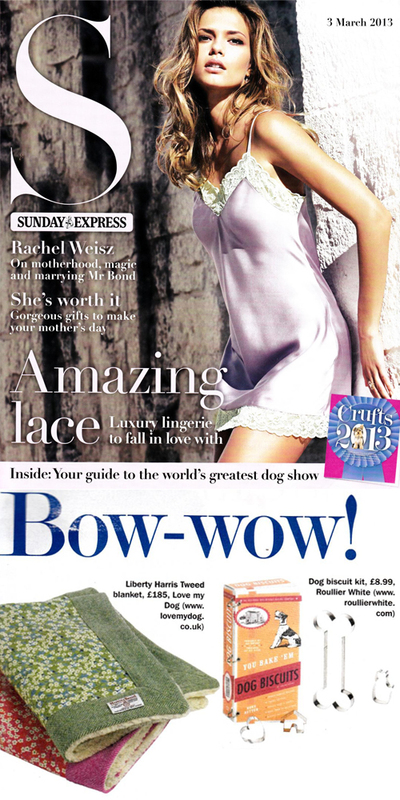 The latest Sunday Express S Magazine featured a guide to Crufts as well as some must-have items for designer dogs, including LoveMyDog’s Liberty Harris Tweed designer dog blanket. You can see our exclusive floral Liberty print dog accessories (including collars, leads, blankets, beds, bandanas and coats) here. 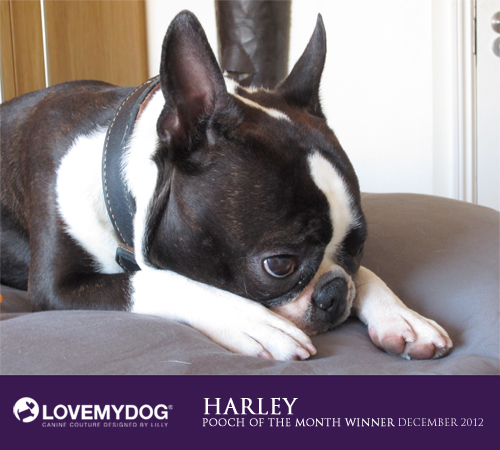 Congratulations to Harley, who is the last LoveMyDog ‘Pooch of the Month’ for this year. A Bow Wow Tie is on it’s way to you just in time for all those Christmas parties! 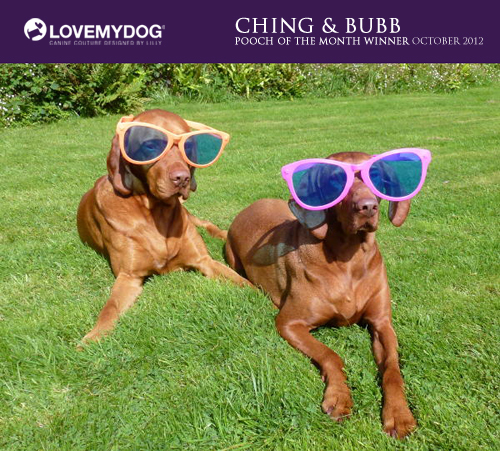 Congratulations to Ching and Bubb, LoveMyDog’s ‘Pooch of the Month’ for October 2012. Ching and Bubb have both won a Thornproof designer dog collar. You can have a look at all of the recent entries in our monthly competition here. 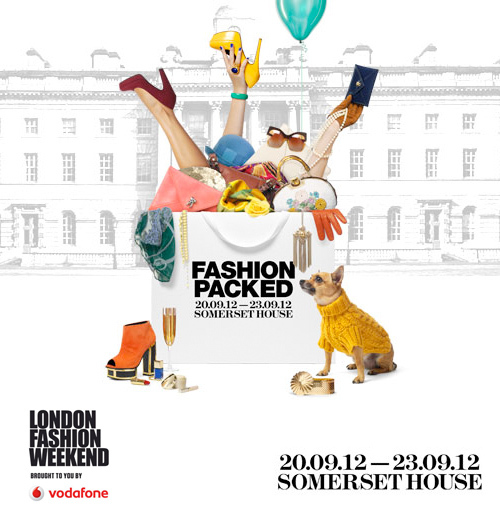 Miss Molly has been Vodafone London Fashion Weekend’s resident stylist for the past 5 seasons. She recently worked with creative agency, A+B, to shoot the new Fashion Packed creative which featured LoveMyDog products and a gorgeous Chihuahua called Ruby. 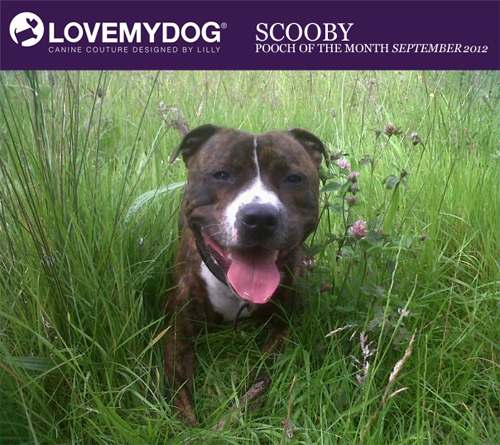 Congratulations to Scooby the Staffie, LoveMyDog’s ‘Pooch of the Month’ for September who has won a LoveMyDog Blue Panama dog collar. Often referred to as the ‘nanny dog’ there are many misconceptions about the Staffordshire Bull Terrier. But Battersea Dogs & Cats Home recently launched a great campaign about Staffies with ‘They’re softer than you think’. You can have a look at all of the recent entries in our monthly competition here.